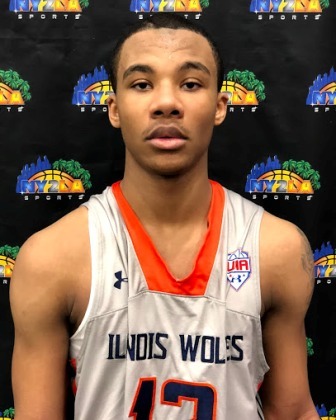 A powerfully skilled forward with the ability to finish at multiple levels, Augillard was virtually unstoppable on occasion as he powered to the rim, ripped the nets from long range, and finished in transition. His effort combined with his activity, instincts, skill, and toughness made for a difficult cover in most games and he showed the ability to put the team on his back and virtually carry them to victory on occasion. A max effort fill the box score forward, Augillard was very impressive throughout each session of this year’s GNBA. The top pure scoring threat in the league this season, Brookshire makes it look easy at times and I’ll venture to see he’s one of the most skilled and efficient scoring talents in terms of movement, effort, and production we’ve had in the GNBA platform, which says a lot considering the past names like Tyler Herro, Jalen Suggs, Jalen Johnson, Courtney Ramey, etc. that come to mind. Brookshire has a smooth effortless stroke and he can knock down jumpers from anywhere on the court while also being able to put the ball on the floor and score through traffic. He has a level of electricity and big moment production to his game and he’s really just scratching the surface. An exceptionally skilled scoring wing, Brookshire is one to know and pay close attention to moving forward. An effortlessly skilled forward with ability to take over games on both ends, Joplin flashed moments of brilliance this spring as he helped power his Ray Allen Select squad to the 8th grade league championships. His skill set is advanced as he can finish at every level, he has solid instincts around the glass, he has nice touch and timing on his passes, and he runs the floor well. A long young forward with a huge ceiling, at his best Joplin is unstoppable when he wants to be. If he can find that consistency game in and game out at the high school level this young talent has a chance to be special, it’s as simple as that. A strong spring campaign for Joplin in the GNBA. A tough skilled instinctive guard who plays with swagger and delivers high caliber production with consistency. As much as Joplin made things happen so did Nau in terms of his creativity, passing, leadership, and ability to score while making big shots when it mattered. He has a smooth stroke with range that extends beyond the arc and he displayed solid mid-range scoring ability and a knack for finish off the bounce at the rim on occasion. He has a bit of an edge to him and that’s good as it elevates his aggressiveness and activity when it needs to happen. Really like his continued progression the past few years and Nau was exceptional at times during the spring while helping his team to the league championship at the 8th grade level. A tough physical wing who can score in bunches like many on this list. Sayles is the go to guy for a big play when AIA Bull needs it and he generally delivers. He can score from every level but he excels off the bounce and in transition as he finishes consistently and efficiently and also does so through contact. A tough athletic wing, Sayles can match up defensively at most positions and offensively few can guard him as he can big boy smaller defenders and when they switch he can take the bigger longer defenders to the perimeter for a game filled with jumpers and blow by dribble drive scoring opportunities. A fill the box score talent with the ability to clean class, generate steals with disruptive defensive activity, etc. Sayles was excellent at times this spring and he continues to make his presence felt in impressive fashion. Stay tuned to GNBABASKETBALL.COM for continued coverage on the 2017 Generation Next Basketball Association.